The homeowners of this project loved the location of their home, they just didn’t like the house! In came the My House Design/Build Team, home renovator Coquitlam, who updated their dwelling into a modern and open concept home. To give the homeowners a quiet space, away from the openness of the rest of the home, we created their private master bedroom retreat. The master suite is its’ own oasis complete with a large bedroom area, ensuite bathroom, and walk in closet. Through double-doors near the foot of the bed, the homeowners have direct access to their covered patio where they can curl up by their outdoor fireplace. 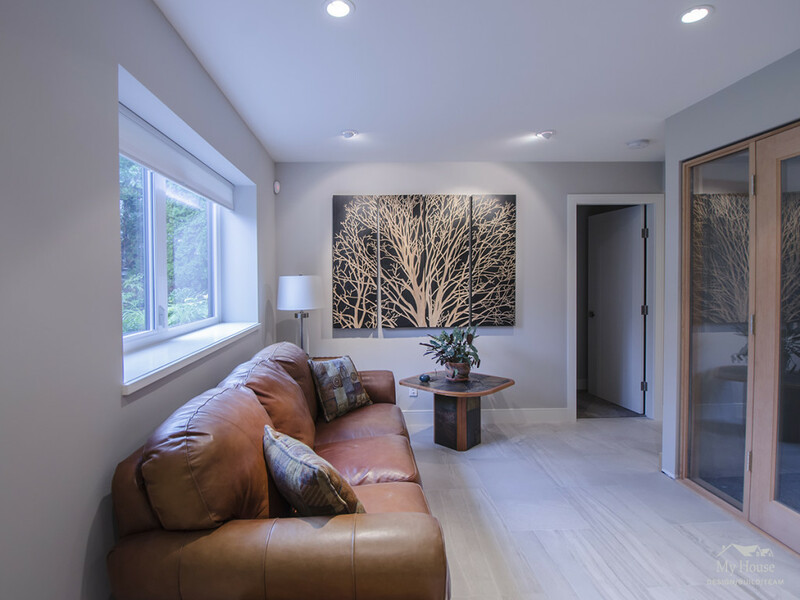 As a home renovator in Coquitlam and all cities across the Lower Mainland, My House Design/Build Team are experts at creating functional spaces that are meant to be lived in. The master bedroom features an open concept ensuite, complete with a skylight brightening the room, a modern soaker tub, curbless shower with a bench, and a striking 3-sided fireplace separating the ensuite from the bedroom. To modernize the home, we kept the floor plan as open as possible. Large skylights throughout let natural light flow into the home, and layered lighting including recessed and pendants create a warm ambiance. To top off the interior ,the staircase was updated with a new glass railing and a hardwood tread. Our homeowners are empty-nesters who enjoy entertaining. To accommodate their entertaining passion, we created a new covered patio with a 2-sided fireplace, couch seating, and outdoor speakers to make the space as comfortable as possible. Not only is the patio accessible from the master bedroom, but from the main living area as well. The front facade of the home was also updated to include wood beams, fresh landscaping, and a gorgeous glass double door entrance. To create your own private oasis, contact the My House Design/Build Team. 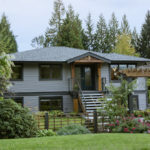 We can help you with home renovations in Coquitlam and the Greater Vancouver area.